The first explorers considered penguins as a "tasty" completion on their menu. They lived almost completely on dry food and were happy to have fresh meat, that, moreover, was easy to catch. But penguins were not only slaughtered for food. They have been caught and slaughtered for their oil too during the years 1800 till 1900. When hunters in 1810 discovered Macquarie Island they first slaughtered the fur seals, and when these became rare, they killed the elephant seals. When those too were decimated, they started with the penguins. Because of the large colonies, penguins were easy to catch and kill. Pro bird half a litre of oil was "won". Not until 1919 these slaughter came to an end. But it is obvious that fur seals as well as elephant seals and penguins have very slowly and only partially recovered from it. On the other side, African penguins were threatened by plunder of their eggs. Round about 1897, 700.000 eggs were eaten. 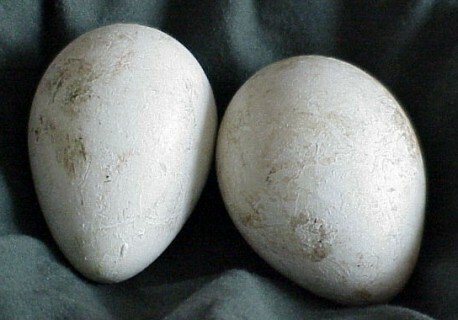 And according the statistics, there were about 500.000 eggs collected in 1925 on Dassen Island. At that time, minimal half a million African penguins must have been breeding there, where yet it only are 10.000 anymore. Still penguin eggs aren't always despised in South Africa and South America. In South America, guano, the residual product of a Humboldt penguin, is collected which means a disaster for their survive. People consider guano as a fertiliser, but by stealing it, seabirds have no protection against the sun anymore and they need it for building their burrows too. Even yet, the fantasy of the industry has no limits. As in 1982, a South American concern wanted to kill 48.000 Magellan penguins yearly to make gloves and other luxury leather articles and sell the flesh. In South America,the "Centolla", a lobster, is offered in restaurants as a delicacy. But when you know that they use penguins as bait, my appetite is over. Luckily there are several wildlifers, under the influence of the German Consul Horst George in Puntas Arenas, guarding the most important colonies.